Assets and rooms can be linked to events. In your church, you might have rooms to hire out in your building. If so, create that room as an asset. This means that when a booking is made in the events calendar, the room can be linked to the event. You can also choose for bookings to be approved by an administrator of a specific asset. Assets attached to events will only display on the calendar for the event organizer, or if the user has the ability to edit events. 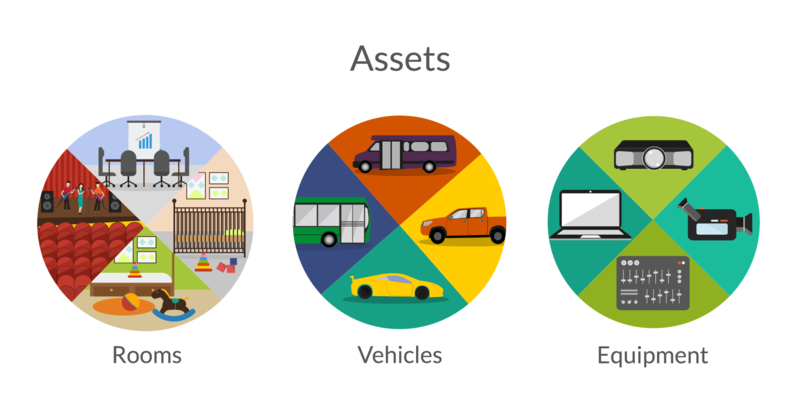 Assets can be assigned to Asset Categories allowing you to categorize similar assets. Asset Categories can be useful for linking parts of a package deal, as well as grouping things into categories such as ‘vehicles’, or ‘rooms’. For example, if your church hall has an attached kitchen, a small stage, and an outdoor barbecue area, a group may only want to use some of those features along with hall. Grouping these assets in an asset category allows people who want to use the hall to easily select what they will and won’t be needing. So other people – like sound guys – who need to facilitate the use of assets – like a stage – will be notified.